Employees restock toys at a Target store in Dallas on Nov. 24, 2017. 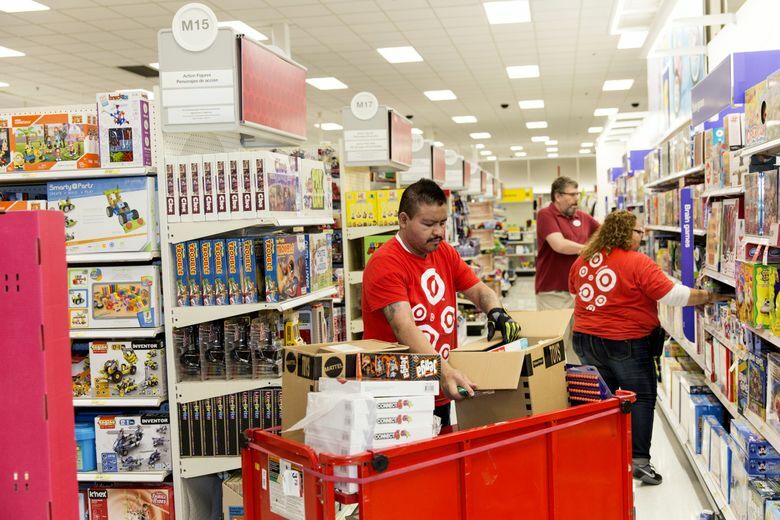 Target is hiring 20 percent more seasonal workers this year during a tight labor market. As a result, the giant retailer is offering more incentives than usual to attract temporary employees. Retail giant Target is hoping to hire 120,000 seasonal workers this year, 20 percent more than it did last year — but knows it won’t be easy. The nation’s unemployment rate, now 3.9 percent, remains near record lows, and retailers say it has become increasingly difficult to attract new workers. As a result, Target is offering more incentives than usual to lure temporary employees to its 1,800 stores and 39 distribution centers. Among those perks: $500 gift cards, starting pay of $12 an hour (a dollar more than last year), and 20 percent discounts on certain items, including fruits, vegetables and workout clothes. “As the marketplace becomes more competitive, the significant investment we’re making in our team sets Target apart,” Stephanie Lundquist, the company’s chief human resources officer, said in a statement. By most measures, retailers are in for a strong holiday season. A low unemployment rate, coupled with recent tax cuts that have increased take-home pay for many Americans, have led to brisk demand for everything from groceries to big-screen TVs. Sales have climbed at a number of the country’s largest chains, including Walmart, Nordstrom and Home Depot, as Americans shop more both in stores and online. “While e-commerce is very easy for the consumer, it’s a very labor-intensive process for retailers, especially in fulfillment centers,” said Neil Saunders, managing director of research firm GlobalData Retail. “The challenge for retailers is going to be filling all of these posts,” he said. Target, for example, says it is doubling the number of seasonal employees devoted to fulfilling online orders. Other companies like Amazon tend to hire more than 100,000 temporary workers each fall to meet holiday demand. Macy’s says it plans to hire 80,000 seasonal workers this year, roughly the same number as it did last year. Kohl’s, meanwhile, began hiring for the holidays in July, in hopes of locking in qualified workers. At Target, executives said they are setting aside more than $2 million this year to give $500 gift cards to randomly selected employees at each of its 1,800 stores and 39 distribution centers. Temporary workers will also receive a 10 percent employee discount on Target purchases, and time-and-a-half holiday pay on Thanksgiving and Christmas. Sales growth at Target reached its highest level in 13 years in the most recent quarter, as traffic to the company’s stores and website rose to “unprecedented levels.” Online sales, meanwhile, rose 41 percent as price-conscious consumers stocked up on toys, electronics and home goods.